Resolving LIMS-plus v3x Helpfile Display Issues – Welcome to JusticeTrax Customer Care! The help files in LIMS-plus that are presented when you click Help>Contents are actually html web pages. Newer browsers are having some issues in displaying these files and making the few changes below may help resolve the issue. You can define the browser compatability from within the help files. Browse to your LIMS-plus server and locate the HelpFiles directory. It will be in the same main directory as your report templates. 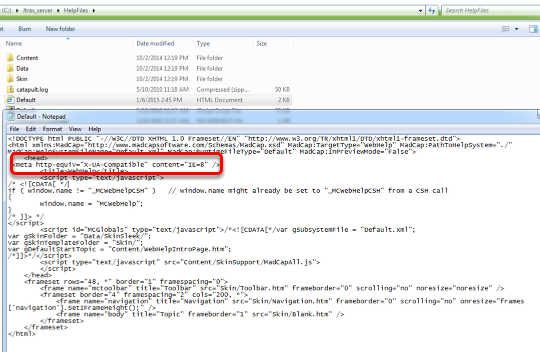 In that directory, locate the Default.html file and open it using notepad. Your help files should now display using Internet Explorer 11. Based on your browser security settings, you may have ActiveX controls blocked. If you are presented with a restriction message, just click the Allow Blocked Content button. Download the appropriate file for your browser using one of the links below. Right-click and select "Run as administrator." After running the file, close the browser and reopen it.